St Paul's benefits from a fine choral tradition, led by our own talented choirs, who lead much of the worship, concerts and other events here. 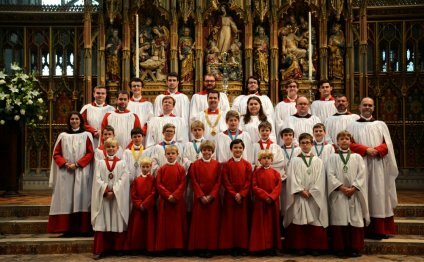 Resident at St Paul's throughout most of the year, the Cathedral Choir consists of 30 boy treble Choristers, eight probationers and 12 Vicars Choral - all professional adult singers who sing alto, tenors and bass. At the heart of the Choir's being is the singing of Choral Evensong each day, with Choral Mattins and Sung Eucharist on Sundays. As well as this traditional routine, the Choir frequently gives concerts and broadcasts, as well as producing critically-acclaimed recordings and touring across the world. The Cathedral Consort was formed in response to the large number of extra services and evening events which take place at St Paul's. It consists of the Vicars Choral and our team of professional sopranos. The Guild of the Companions of St Paul is the network for old Choristers of St Paul's and musicians who have been associated with the Cathedral. Trinity Cathedral Choir Concert in Moscow "House of Music"